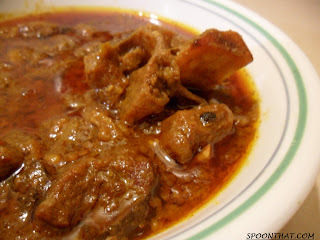 One dish that bangali people looooove is beef curry with a lot of spice. Bengali household staple dishes are basically a rotation between chicken curry, beef curry, vegetable curry and fish curry. Kids usually drive their parents to have either chicken or beef curry on hand (I know I did!). Adults also have a special place in their hearts for this simple yet homely curry that just takes them back to the days when their mothers used to have warm food ready for them on their return from school! Although many adults have become health conscious due to diabetes and high blood cholesterol and pressure becoming more and more common to us desi people, most people will still give in and eat this curry at least twice or three times a month. 1) In a big pot, combine all the ingredients, and mix. 2) Turn on the stove to high and fry cook the mixture until meat is sealed. 3) Turn down the heat to med-low and cover while cooking for 2 hours or until tender, stirring occasionally. 4) Add water as needed to prevent the meat sticking to the bottom of the pot.